This is a classic Shanghainese dish that requires no cooking at all and is simple to make. For us it is a kind of comfort food. 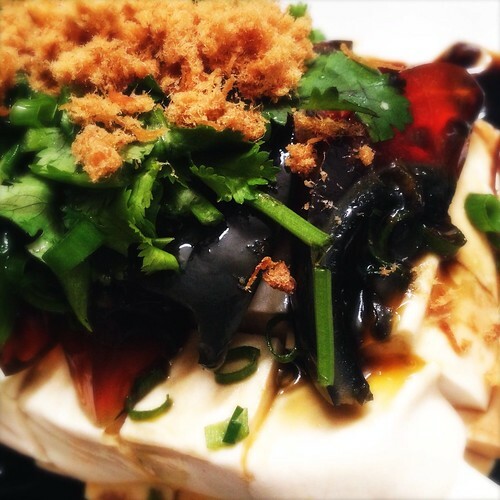 It relies on the made-in-heaven combination of two very Chinese ingredients: tofu 豆腐 and thousand year egg 皮蛋. There is the delicate silken texture as well as the rather bland taste of the tofu which lends well to absorbing introduced flavours. To counter that there is the pleasing slipperyness and luscious gooeyness of the thousand year egg with its strong distinctive flavors. Rather like some kinds of good western cheese, there is at first a unique smell and texture and then the scrumptious flavor comes to you. Once you are acquainted with its flavor and texture, thousand year eggs become a special sensory taste treat. 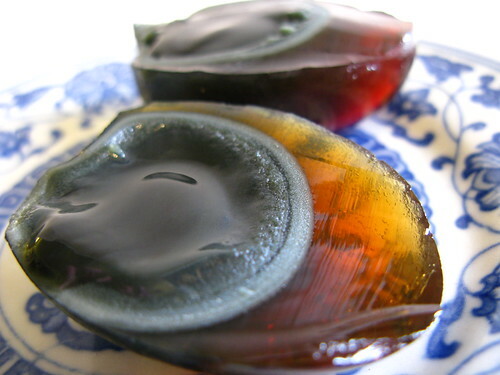 Thousand year eggs are duck eggs that has been preserved using a mixture of clay, ash, salt, lime and rice hulls. The whites become a translucent brown black and the yolk turn a beautiful green grey color. Beware that not all thousand year eggs are created equal however, so one must look for the good ones. So far we have had good luck buying thousand year eggs at the Hong Kong wet markets. Just 'buy and try', looking for eggs that have a gooey soft texture for the yolks (known in chinese as 糖心皮蛋, or 'sugar heart' thousand year eggs) and a springiness to the whites. If the yolk is hard or there is a very strong scent of ammonia, that is a bad sign. Of course the perplexing problem when you are buying is that one doesn't have Superman's x-ray vision and therefore cannot see inside the egg. 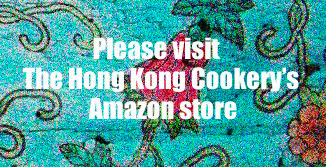 Look for the chinese words 糖心皮蛋 is one good method, if the vendors put up a sign (which a lot of them don't!). Another tip that we picked up was to place the egg in the palm of your hand (the egg must be already cleared of the clay mixture of course) and to use your straightened out index finger to lightly but firmly hit the egg on its side. You should be able to clearly feel the springiness. (But folks around you might wonder why you are karate chopping the black egg!) This will tell you about the caliber of the whites, but as for how to tell beforehand if the center is the right gooeyness, we're still in the dark. Lastly, but important!, you will need to look for lead free on the packaging, as there was a time when bad food practices of the manufacturers led to the use of lead in these eggs. Another possibility is to purchase them from Yung Kee Restaurant, a restaurant in Hong Kong that serves excellent thousand year eggs. It's very expensive though, at HKD 13 per egg (including their delicious pickled ginger that they serve it with in the restaurant.) At the wet market you could probably get 4 eggs for that price. We recently discovered much better eggs at a small local grocer, costing a bit more but really delicious with gooey ooey centers (see the photo just above). If you love your food, it really pays to poke around and ask, ask, ask. For the tofu we have been having good success with the local Hong Kong organic tofu that seems to be popping up more and more everywhere (yeah!). The flavor is very good as opposed to the regular tofu which often tastes a bit on the bland side and the texture is surprisingly silky (despite the look of it). If we can't get organic then we go for the silken tofu or the tofu for steaming. As always with simple dishes, the quality of the ingredients becomes very important. So look for good eggs, good tofu, use good soy sauce and sesame oil and it will make a huge difference. Hope your family enjoys this dish as much as we do. Place the whole tofu block in a deep dish and pour boiling water over to cover. Let sit for at least 10 minutes and then slide the tofu out on to presentation dish. Carefully slice the tofu into 1 inch squares and then leave aside to allow time for water to exude. Scrap off all the clay and rice hulls that cover the thousand year eggs and rinse the egg clean. Crack open shell and remove. You may see some white snowflake patterns on the 'white' of the egg, don't worry this is okay. Slice each thousand year egg into 8 wedges. Wash and dry cilantro and loosely chop. Drain water from tofu. Arrange tofu and thousand year egg attractively on the plate. Remember that the tofu is quite delicate and so requires careful moving. Pour soy sauce and sesame oil over the tofu. Sprinkle on the chopped cilantro and serve. Thanks for the great tips! What is the purpose of pouring boiling water on the tofu?